The Milestone is the luxurious London flagship of the Red Carnation Hotel Collection. 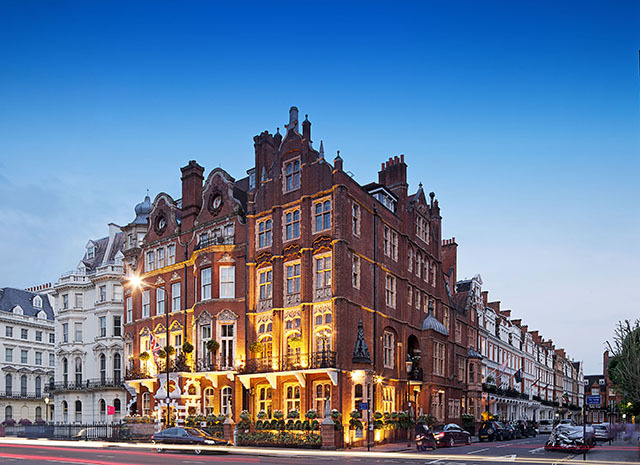 Its location near the Royal Albert Hall is complemented by its intimate view of Kensington Palace, home of several members of the Royal Family, including the Duke and Duchess of Cambridge. Each of the hotel’s 62 guest accommodations is individually decorated – furnished with antiques, opulent fabrics and upholstery, and a dramatic sense of pampering. The Milestone is home to Cheneston’s Restaurant, specializing in the best of modern British cuisine, and the clubby Stables Bar and its adjacent black-and-white striped Conservatory. The Park Lounge, with its outlook over Kensington Palace, is where afternoon tea is served. The Milestone is a member of Leading Hotels of the World.